Read more about the Department of Applied Linguistics. The master's track Applied Linguistics at the University of Groningen is a unique track focussing on the processes involved in second language learning, as well as teaching theories. The programme encompasses various fields of study, as learning and using a second language may be approached from many different angles. Students will explore and discuss the factors that relate to second language development, including cognition, psychology, social interaction, language teaching, and culture. In addition to theoretical and teaching paradigms, students will also take classes in the research practices and methodology essential for conducting applied linguistics research. These classes will act as the foundation from which students will be able to conduct their own applied linguistics research in the form of the MA thesis in Semester 2. The master's track Applied Linguistics is a truly international programme, welcoming students from all over the world. The classes are taught entirely in English, and students are encouraged to use their own language experiences as the basis for their individual linguistic enquiries and research. Our programme is small, which means that students benefit from small, intimate classes and close collaborative relationships with the other students as well as instructors. Sample of academic writing: a thesis or a research paper that was written in English, preferably on a topic related to linguistics. Warning: it has come to our attention that some applicants hire companies to prepare their CV, motivation letter and reference letters. We encourage you to write your own personal motivation letter. We cannot be held accountable for the consequences (e.g. the difficulty of following and finishing the MA programme) of admission on the basis of non-authentic papers. After completing this track, you can pursue a career in research, or work in the field of language teaching and educational publishing projects. You are also equipped to take positions that deal with issues of language policy. Research in Applied Linguistics focuses on the process of learning and using a second language. It covers various fields of study because learning and using a second language can be approached from many different angles, including cognition, psychology, social interaction, language teaching and culture. I had had more than six years experience in the department of TEFL (Teaching English as a Foreign Language) before I decided to further advance in my professional career. To do so, I wanted to acquire a more in-depth understanding of how languages are learned and which neuroscientific components and teaching methods are involved in the efficient and sustainable acquisition of a second language. The degree of Applied Linguistics contains a lot of research and skills to be obtained. Despite being challenging, the study is interesting and keeps students as well as staff engaged with the topic at hand. I particularly enjoyed the modules concerning Statistics, Language Development, and Teaching Methodology. The advanced level of teaching in combination with being on the forefront of research in this field also results in great employment chances when entering the labour market. With Groningen being a very international city, I made friends from all over the world, which was an incredibly enriching and inherently positive experience. and the supportive staff and academic surroundings. I aspire to continue working in the field of TEFL material development. My time in Groningen has immensely contributed to obtaining the skill-set required for this work. I was lucky enough to spend one semester at the Department of Applied Linguistics in Groningen, where I chose to follow the modules of Research Methodology, Teaching Methodology, and Theories of Second Language Development. Learning and comparing different theories of language learning, acquisition, and development enabled us to think critically about the discussed issues and also taught us how to conduct our own research. person as I was privileged enough to spend half a year in a very international environment, which enriched my academic skills as well as my general knowledge. The university and city of Groningen have been the perfect choice for me and I could only recommend studying there! I not only learn about the theory, but also I am equipped with the practical experience. When I was an undergraduate in 2010, studying abroad was nothing more than a mere dream. Five years later, this dream became reality! I thanked God that after so much effort, I had finally been able to obtain a scholarship from LPDP (Indonesian Endowment Fund for Education). Shortly after, I was accepted in the one-year Applied Linguistics MA program in Groningen. This degree was really everything I hoped for as I aspire to become an English teacher in Indonesia. Besides gaining a theoretical insight, I have also acquired practical experience in this field. These experiences and qualifications will undoubtedly benefit me in my career within teaching and education, particularly towards TEFL (Teaching English as a Foreign Language). "The teachers are experts in the field and lectures and seminars are balanced in terms of theory, and individual and group assignments." I ended up choosing the MA in Applied Linguistics due to my interest in language as such and particularly my interest for finding the best method of teaching and learning second languages. The degree at RUG appealed to me as it balances theory and practice incredibly well. Simultaneously, I was looking for a program that was affordable and did not exceed the span of one year. I cannot say I have been disappointed: the instructors are experts in their field whilst lectures and seminars are well-balanced in their emphasis on theory, and individual and group assignments. This keeps the seminars very engaging as there is always room for debate within the group. As with any MA program, it is a lot of work. However, the studying certainly contributes to our academic development. A question I frequently hear is: “What is applied linguistics? Are you going to be a teacher?” The actual options are much broader: following the completion of The MA, you will be an expert in teaching languages. This enables you, for instance, to work in a language centres, as an advisor as on how to acquire language, or as a researcher. Applied Linguistics is the perfect master for me, because it combines theory in the field of applied linguistics with more practical implications such as teaching methodology. The information I received during the master events I visited matched exactly with the content of the master, so it definitely matches my expectations. If I had to give a summary of the master it would be: theory, application of theory, challenging, and international. Of course, studying at master level takes some time. We have about 12 contact hours and besides that there is quite a lot of self-study involved as well. We have the opportunity to go on an internship in the second semester. Although this may seem like a lot, it really does not feel that way. I believe that if you think something is fun and interesting, putting in the work is no problem at all. Read more about Judith Selder and why she chose to study Applied Linguistics in Groningen! Questions? Send Judith an e-mail! Are you a non-EU/EEA student from Mexico, Russia, China, India, or Indonesia, starting a Master's track at the Faculty of Arts? 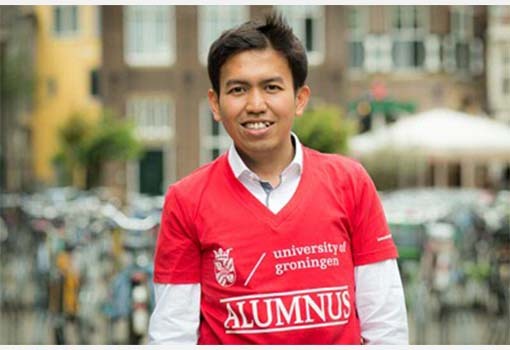 If so, you could qualify for the University of Groningen OTS/Talent Grant, Faculty of Arts, a partial scholarship which helps you to finance your studies. Are you interested in a research oriented career? Please also check our Research Master's Programme of Linguistics.